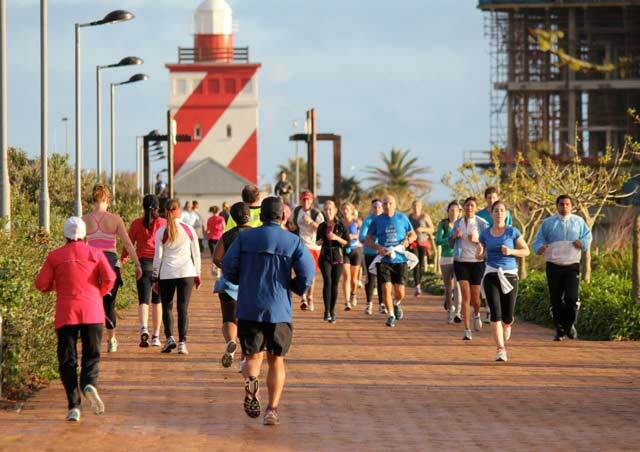 In this eddition of the SA parkrun newsletter, Hobie Beach parkrun is launched in Port Elizabeth. We here from Cape Town’s Greenpoint parkrun as well as St. Francis parkrun. 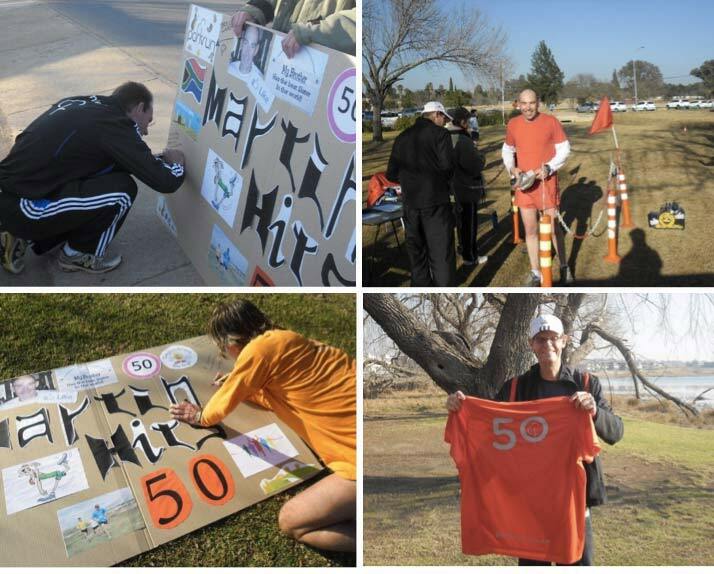 Discovery Vitality offers runners heathy living tips and parkrunners are reminded of the process to claim their T-shirts. 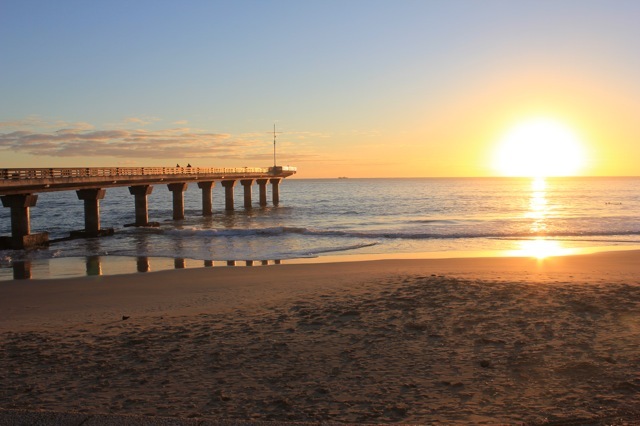 It would be hard to match the beautiful sunrise that greeted 178 excited parkrunners at the inaugural Hobie Beach P.E. parkrun. 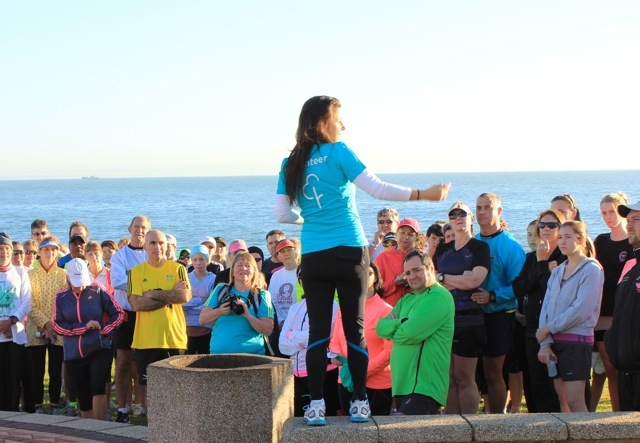 The cold ,wet weather that preceded last Saturdays launch gave way to a stunning morning and after a few words from country manager, Bruce Fordyce and event director, Rosalind Wilson the runners and walkers set off on the 5 kilometre course. What a special parkrun it is too. Afterwards the general consensus was that it is one of the best parkruns in the country and that Rosalind and her team of volunteers have done a wonderful job. The PE Hobie Beach name has prompted us to ask for a change in the Summerfields parkrun in Hazyview to Kruger Park-Summerfields parkrun to more accurately describe its exact location. 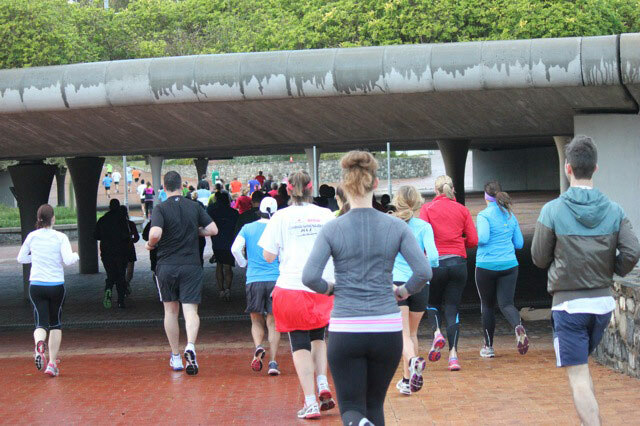 On Sunday SA parkrun numbers exceeded 21000 for the first time. It seems that it was just yesterday that there were only 22 of us! There will be no new events for the next few weeks as we consolidate after quite a hectic few months. However we have had enquiries about parkruns in Pretoria, Bloemfontein, and Nelspruit and we are very keen to find someone interested in starting a parkrun in the South of Johannesburg. If you are new to running it’s advisable to start slow. First combine walking and jogging and steadily increase the time and the distances you run. When it comes to nutrition, remember to boost your energy. Eat a healthy, substantial meal that will give you enough energy for the run. Not too heavy though – it can cause discomfort during a race. Try different meals during your training to see what works best for you. I had found parkrun last year when I was looking for running groups to join. But it was only at the Two Oceans expo that I met Gill and Bruce and was thrilled I could actually speak to someone about Greenpoint Park being the perfect location for a parkrun. 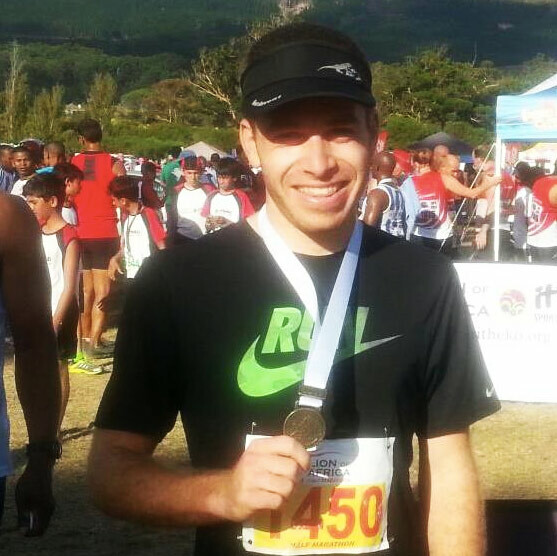 I live in Greenpoint and was training for my first Two Oceans half, and so had run all over the area while I was building up my mileage, and time and again I was astonished and saddened that having paved a route for runners/cyclists, it was being wasted as hardly anyone used it. However, it involved crossing a road close to a junction in the middle of the run, and doing one section of the park 3 times. Gill and Bruce (our dear parkrun SA parents) had been here and had tried to find a 5km previously, but with no luck, due to time constraints. The route had to be reworked to really enjoy the park and surrounds (including the stadium, views of Table Mountain with Lion's Head and Signal Hill, glimpses of the sea and the lighthouse) and to be easier to manage logistically and keep to parkrun concepts. After a couple of trials we managed to work out a route that would reduce the difficulty of managing it, keep the park managers happy (by starting and ending outside the park) and keep to the safety aspect of parkrun, by removing the road crossing. I had interesting meetings with the park manager, and the local police - both of whom tried to impress on me about keeping the run 'contained', not realising that the whole ethos of parkrun is for people to enjoy the space with as little disturbance as possible and to leave it as it was found. This route is almost all paved and so quite accessible for less able people and child strollers. Once we were clear of the City restrictions, due to Cape Town having so many events all the time, because they had also seen how low risk and low impact parkruns are, when Big Bay launched, it was onwards to our launch! We watch the numbers rise and rise, and being the only parkrun in central Cape Town, we expect this to be huge. We expect lots of international visitors. But most of all we expect people like ourselves to come and enjoy this beautiful landscaped park. When they built the stadium (which was contentious for various unsatisfactory decisions), the park was just a spin-off to try to keep the locals happy, as there used to be a much larger area which was designated public space. Now the park itself is a true gem! This parkrun has the potential to be really fast as it is on a solid surface with good traction, little incline and, once you get used to them, the turns are fine to manage. But it also is so gentle that you could decide to take it easy. Finish it slowly, then grab your picnic from your car, and sprawl out on the lush grass in the park beside the water afterwards, with a couple of mates, for a whole long summer's day in the sun. Five Saturdays ago, on 13 July 2013, St Francis joined the global parkrun family. We were extremely proud that we broke the launch record – I mean, we are one of the smallest communities who are part of parkrun and WE DID IT! Two weeks later we had terrible weather - and despite that still more parkrunners than what we had a year ago for an event with cool prizes and lekker goody bags! We have welcomed visitors from the UK, who brought their friends from Dubai, we had parkrunners here from Nahoon and Modderfontein – and two of our runners braved the city traffic to attend the Greenpoint launch! Our local parkrun family is growing rapidly. I can’t decide what is the best – to see parents running with their 4 and 8 year olds (or 4 and 8 year olds running with their parents!) or to see someone running you know who is actually very ill and should be in bed. The motivation is heartwarming and we are proud to be part of it, it is extra special to us as we know the majority of the people, as well as their circumstances. We finish our parkrun with a well deserved coffee and bacon ‘n egg roll at the St Francis Links Clubhouse – where we say goodbye with "well, see you next week – same time, same place!" PB: I help with the timing and this week I'll be marshalling also. Number of times volunteered: It's made me focus on speedwork, and each week have worked hard on improving my time and getting down to the 20-minute milestone. What do you do at parkruns: That it's open to anyone and everyone, requires no fussy forms or entry fees, is community-driven and promotes health and wellness! How has parkrun changed your running: Well, I finished 5th in my first two parkruns and in the 3rd, I was coming 6th with about 500 meters left. I pushed myself and passed the 5th place runner who was a few meters ahead of me and then made sure to get a bit of a gap between us. I guess I let my guard down because about 20 meters from the line, a totally different guy came past me, totally out of the blue! I wasn't going to let him steal 5th place however, and I sprinted to the line and finished 2 seconds ahead of him. That really proved to me how much 'reserve' energy we actually carry, which we can call upon when required! Please follow the process to request your T’s. We had a problem with the system a couple of weeks back. Please be sure to follow the instructions on your notification email once you have completed your milestone run. It is only upon receipt of your reply to the email that the correct T-shirt is ordered and sent to your parkrun for collection. In this edition of the SA parkrun newsletter, we look at the growth of parkrun in around the country as the the tide of red T-shirts move in. Greenpoint and Dusi parkrun join ever-growing list of SA events and our national sponsor, Discovery Vitality, bring you health tips. The weather gods were clearly on the side of Greenpoint parkrun last Saturday. Rain had lashed Cape Town for several days and things looked quite miserable for the inaugural run in Cape Town’s Urban Park. But then on Saturday morning the clouds rolled away and there was sunshine to greet over 100 keen parkrunners. Suraj Veland and his team organised a superb inaugural run and it was a special treat to run in the shadow of some iconic Cape Town landmarks; the Mouille Point Lighthouse, Lions Head and the fabulous World Cup football stadium. 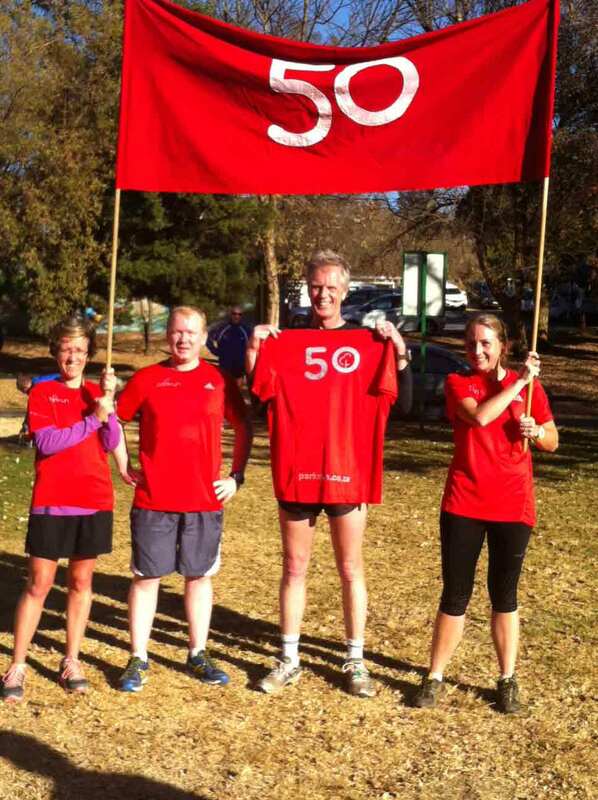 Last Saturday Roodepoort parkrun was proud to hand over our first Club-100 member T-shirt to Willem Loison. Many of us will remember the excitement that was generated when Tracy Rankin and Dieter Meyer earned their Club-50 member T-shirts several months ago. Well now the Club-50 members are sprinting in. It seems that every Saturday a few more members earn their red T-shirts. At the same time we are rapidly approaching the landmark number of 20000 registered parkrunners with over a thousand registering each week. 1995 Comrades champion and Comrades gold medallist Shaun Meiklejohn and Kerry Koen combined forces to launch the Dusi parkrun in Pietermaritzburg. 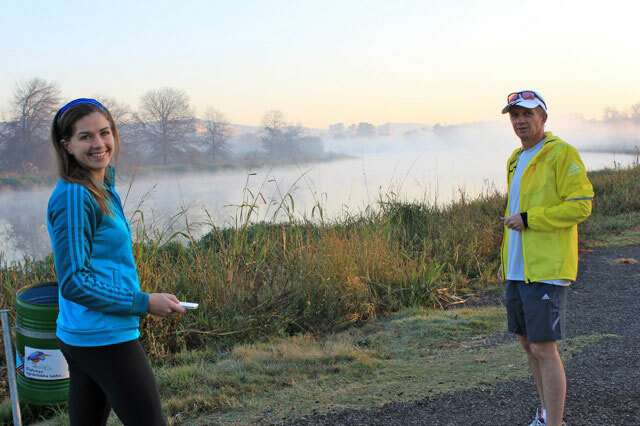 This stunning parkrun follows the banks of the famous Dusi River, starting and finishing at the Camps Drift clubhouse. 132 eager parkrunners ran the inaugural run on a beautiful misty morning. For those of us who have paddled the Dusi canoe race it was a unique experience to run where we have formerly paddled. If you’re a beginner and are about to start a new fitness programme (including running), remember to talk to your doctor first. Know your health and check your blood pressure, body mass index, cholesterol and blood sugar. If you haven’t yet, go for a Vitality Health Check at your nearest pharmacy – you’ll earn Vitality points too! Attendance at Delta has grown dramatically since the arrival of Discovery Vitality. We are now consistently getting figures in excess of two hundred per event. It is a relief that very few growing pains are evident at this stage. Our top point holders for this year are David Orpen and Rita Loots. Congratulations to both of them! We also have four new Club-50 members. Well done to Claudine van Graan, John Rollason, George Ashworth and Paul Gerrard. The AdiCaddy is making its presence felt. The prizes drawn at the end of an event are making an impact. Please make sure that you take full advantage of this wonderful opportunity. The AdiCaddy is making its presence felt. The prizes drawn at the end of an event are making an impact. Please make sure that you take full advantage of this wonderful opportunity. If you are a Discovery Vitality member please remember to associate your membership with your parkrun account. This can be done via the "manage my profile" button in your newsletter email, or you can always request a reminder link to your profile. The completion of an event gets you 500 points! Thank you to all the volunteers for making the Delta parkrun a success. Please feel free to offer your services as a volunteer when you can and don’t forget to motivate your family and friends to enjoy a run in the park. Numbers, numbers, numbers - parkruns are all about numbers aren’t they? You go to bed at 10 the night before, set your alarm for 05h30; get to the run at 07h45, start at 08h00, and finish anywhere between 17 and 70 minutes later. Then you get the important numbers like Club-10, Club-50 and Club-100 so far achieved on home soil. 10 for the juniors and 50 for the seniors. Naturally, you also get numbers like 109, the record number of runners we had at Ebotse last week, and that equals 218 running shoes pounding the paths. Then there is the temperature - it was a balmy 7 degrees when we set off. And don’t forget the date – day 27, month 7, year 2013. You also wait 5 or 6 hours for your results, which give you another couple of numbers, where you were placed, where you placed in your gender, your percentage, and how many runs you have completed. You also see how many ladies completed the run and how many men - more numbers. There are also visitors – we had 3 from Roodepoort parkrun. We enjoyed your company, please visit us again soon! Back to the exciting number – 50. 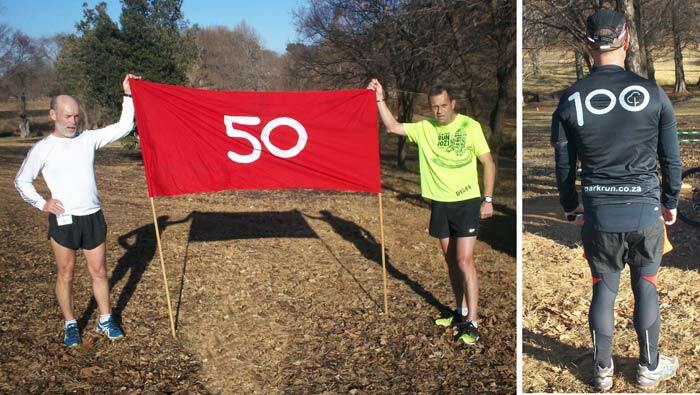 Over the last 2 weeks, we saw 2 of our runners completing their 50th parkrun, both ‘full-time’ volunteers – Gary Jackson and Martin Cordier – the 1st from Ebotse parkrunner to do so. Congratulations guys! Your dedication is appreciated by all. Martin was also our 1st points winner. Does he run too much? A number of people were either paid by Martin, or he is really well liked, as there were cheese puffs and a number of other goodies to celebrate his half century. I think he paid people. Check out the following pics for more info on this little story. Clockwise from top left ~Darryl ~ he’s next ~ paying homage on Martins’ poster, Martin at the finish, Gary, our 1st 50 jersey holder, holding his 50 jersey, Jan, also paying homage. The year was 2011. It was October on a Thursday morning. The cellphone rang. We answered. The voice on the otherside replied “Hi this is Bruce Fordyce! We are launching parkrun to South Africa, and are doing a reconnaissance this Saturday at Delta Park, could you assist?” This is how our parkrun journey began. 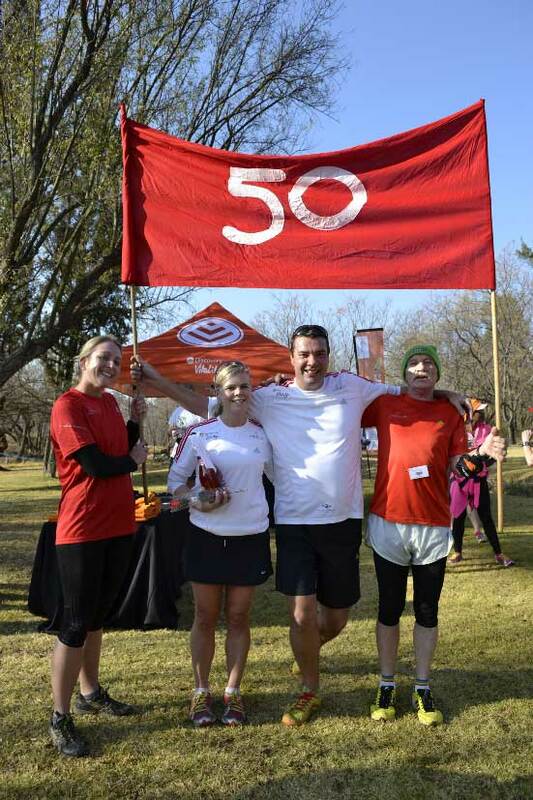 We have appreciated juniors being handed their 10 T-shirts by Bruce, witnessed close friends as they achieved their 50th parkrun, always in admiration of the dedication in reaching their goals, and have the privilege of hosting our own event in the Modderfontein Reserve. It has taken us 88 parkrun South Africa days to finally join “The Club”, and we look forward to many more parkrun celebrations. We would like to thank our National Sponsors, in particular Blue Label Telecoms for supporting parkrun from the outset. To adidas for the spot prizes, Discovery Vitality for the points (plus the coffee and muffins), our local supporters Heartland, the Endangered Wildlife Trust and Paint Trade, as well as Talisman Hire, Edenvale and Castle Genie for their support on the day. In the Nahoon Point Nature Reserve, over the next three Saturdays, and indeed beyond, there will be much to celebrate. 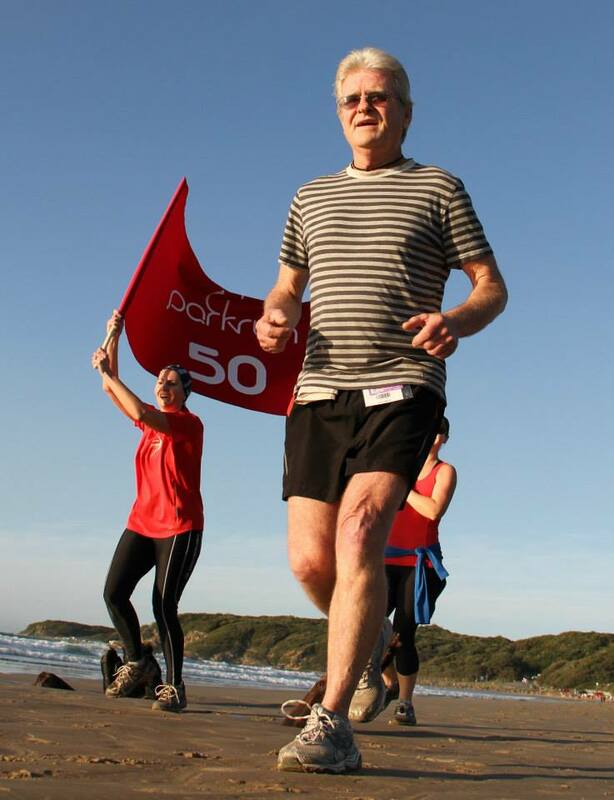 The first celebration will be for and with Gavin Giblin as he runs his 50th parkrun – all of which will have been on our challenging course of beach, steps of note, narrow bush paths, jeep track, climbs to the lookout point, down twisty sand paths to Mermaids Pool and its rocky surface and then up “that darn” sand dune hill, which is not always “affectionately” attributed to the course originator. Giblin will receive a huge reception at the finish and again next week when he receives his Red T-shirt. Next week will be our 52nd run and we are going to celebrate it as our birthday run. The girls have all been hard at work preparing as only they can. A number of other runners are really close to their 50, with Noel Acton on 46 being the most interesting case given that if it were not for his wife, Annamarie, hauling him along to the very first parkrun, he may never have arrived at all, but now it is the same wife who took him travelling down the coast, resulting in his missing a crucial parkrun and making him wait somewhat longer for his moment. He does, however, have the satisfaction of being two parkruns up on the good wife and rubbing it in every week. 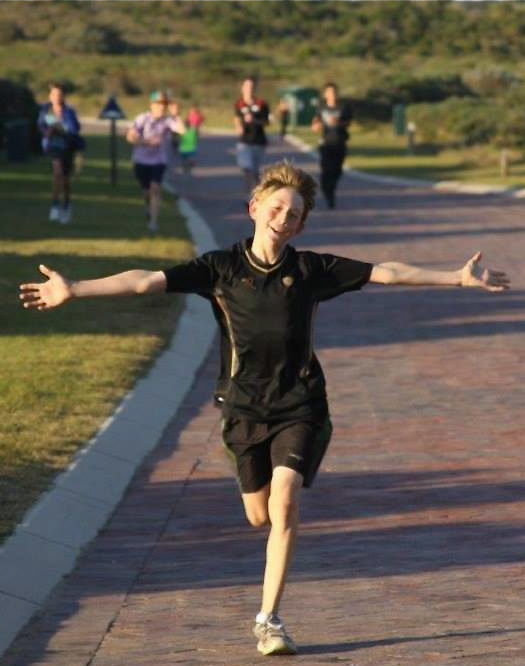 Oliver Ive, who was neck and neck with Giblin, finally succumbed at the weekend of the Argus Cycle Tour and has since missed three more, which means he has five more runs to do. Next to follow are Henry Pienaar, Craig Giese and another husband and wife duo in Graham and Marie Claire Hand who are all on 43. So as to ensure the community keep the mood flowing there will celebrations on the event’s anniversary come 10 August, the same day that our neighbour, PE Hobie Beach, launches down the coast. Pienaar is meanwhile nearly 200 points clear at the top of the men’s Points Table with just two runs left for the year, and this despite him running at Kidds Beach a three occasions. Giese is in second and Ive third. Candy Boonzaier had lead the women for many months, until a recent overseas stint saw her overtaken by both Caroline Selkirk and Caron Williams. It is going to be a tight run in for the “girls” and anything could still happen. This has been an incredible first year at Nahoon Point parkrun and if the second one offers anywhere near as much activity as the first, it is going to be huge.